The 9204 stack chair comes with a frame constructed of 18-gauge steel and 7/8 inch square-tubes enhanced by a 5/8 under seat and H-braces. In order to protect the powder coated frame finish from scratches,12 plastic stack bumpers have been placed on the inside of the legs. A 2 inch foam cushion seat provides comfortable seating, especially during those long seminars and meetings. These chairs come fully assembled and are easily moved and stacked with the convenient hand hold. Comfort, strength and price combined, these chairs are perfect for the cafeteria, corporate banquets or casual gatherings! 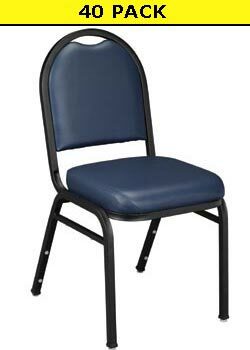 Competitive Edge Products, Inc. is an authorized retailer of the 9204 Midnight Blue Vinyl Stacking Chair. 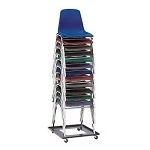 All NPS 9200 Stackable Chairs are made in the U.S.A.
Q: How high can these chairs be stacked? Fast Shipping: Orders for the National Public Seating 9204 (40 Pack) generally leave the warehouse within 2-4 business days.